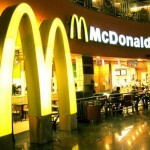 The McDonald’s Corporation is helping thousands of people find the fast track to a new career. On April 19th, the company held one day interviews across the country to super size its staff with an additional 50,000 new hires. The company says this hiring blitz is also a way to help shift stereotypes that working in fast food is a dead-end job. McDonald’s wants to redefine the term ‘McJob’, a word published in the Oxford English Dictionary as “an unstimulated, low-paid job with few prospects.” These new positions are a combination of full and part-time work, ranging from cashiers to restaurant managers, and with an average pay of $8.30 an hour. The company is confident a crew job can put you on the track to corporate success, pointing out many of its executives started with the company working in restaurants. Jan Field, current President of McDonald’s USA, started with the company as a cashier back in 1978. Field isn’t alone in her corporate climb, McDonald’s boasts 50 percent of its corporate employees began their careers as crew members. While I applaud the fact that thousands of people are being hired, what I admire even more is all of the publicity the company was able to bag for this event. The company says it traditionally beefs up its staff in preparation for the summer months. A spokeswoman says last year, McDonald’s hired 50,000 new employees during the month of April. Looks like the Golden Arches were able to turn an annual occurrence in a golden public relations event.